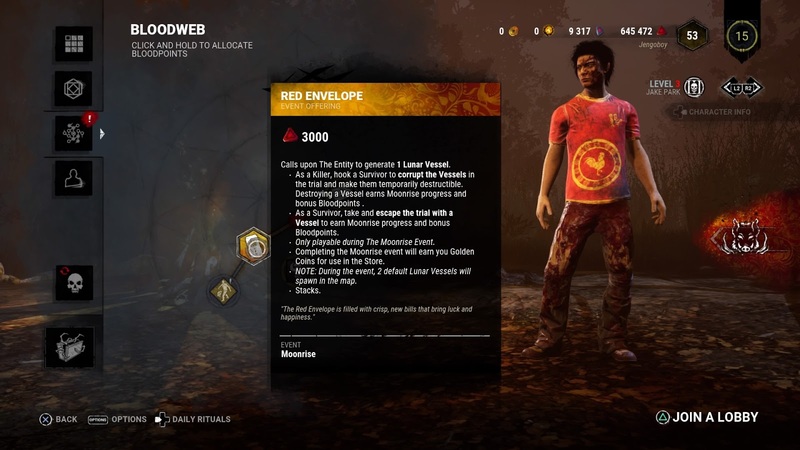 Another cool seasonal event is happening right now for Dead by Daylight! 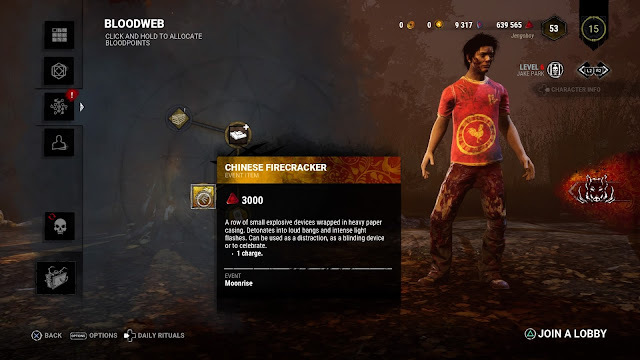 Of course, the world is celebrating the Lunar New Year (Chinese New Year) right now and Dead by Daylight has something special for the players. 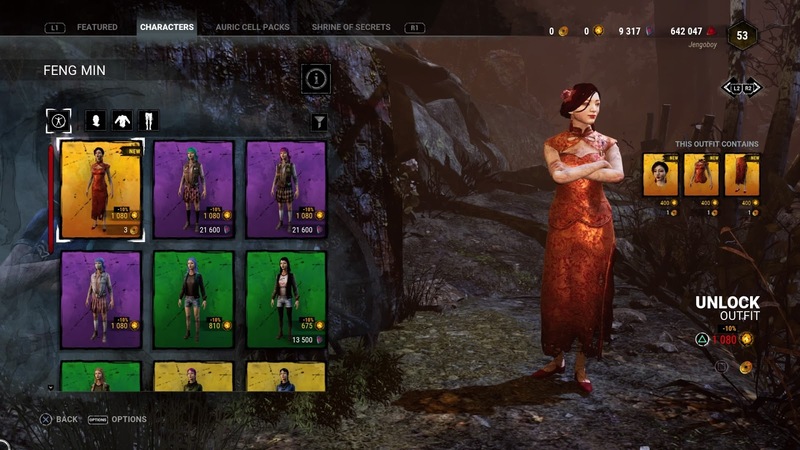 Here are all the event details..
3 exclusive outfits have been added to the game for The Huntress, Feng Min & Ace Visconti. These can be unlocked via Golden Coins which are only obtainable during the event. The Golden Coins expire only on Feb 27 however, after-which the cosmetics can only be purchased via Auric Cells (the game's Store Currency). 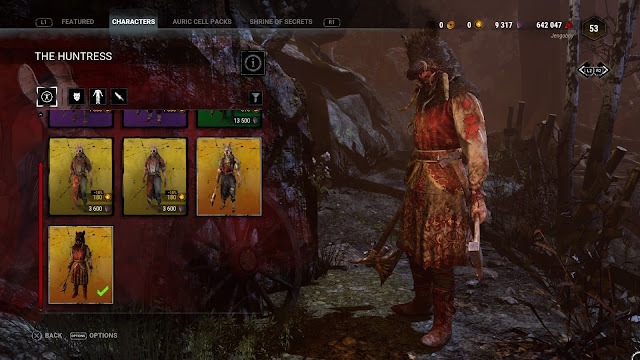 With this being the Year of the Pig, The Huntress gets a cool boar outfit. As always, my priority always is for the Killer Outfits and I have already unlocked this. Feng Min and Ace look dashing in the traditional outfits as well. Hoping to be able to earn enough Golden Coins to unlock these as well. A new game-play element has been added for the event, which will run from Jan 30 - Feb 13. 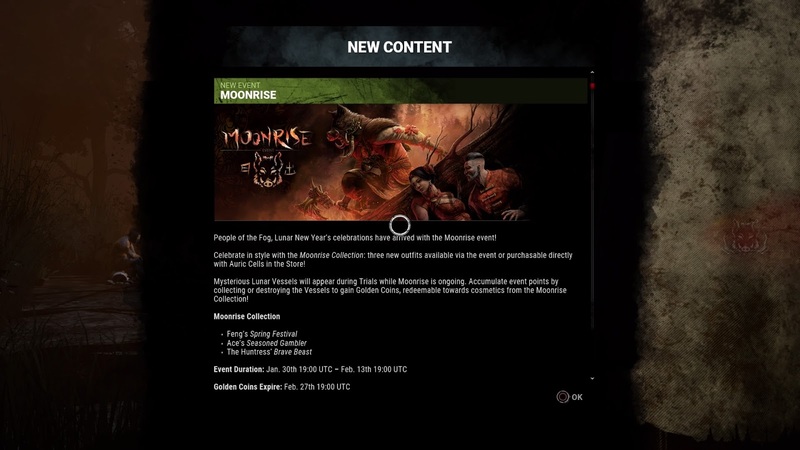 This will allow players to earn Golden Coins needed to unlock the above cosmetics. Survivors will need to find and take a Lunar Vessel. 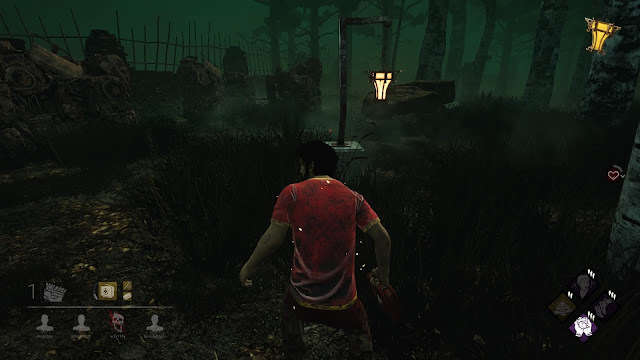 When a Survivor is holding on to a Vessel, embers surround the player. If the survivor gets hooked, the embers disappear and the Vessel is returned to its original location. - Escaping with the Vessel. Killers will need to find destroy these vessels. However, this can only be done when the vessels are in a destructible state, which is when a Survivor is on a hook. This will turn the Vessel's colour to red. The Moonrise Event also adds 1 Item and 1 Offering to the game. 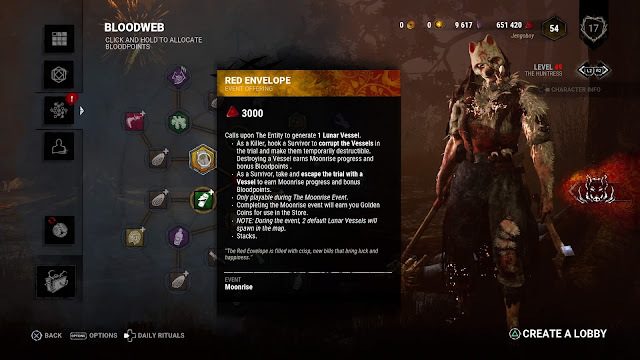 The Red Envelope adds 1 Lunar Vessel to the match, on top of the default 2 that spawns every match. The Chinese Firecracker works as a blinding device or a distraction. Very cool if you use it right! Fun stuff! Enjoying this new game-play element but you will need lots of Golden Coins if you want to unlock all 3 Outfits. Going for it though! 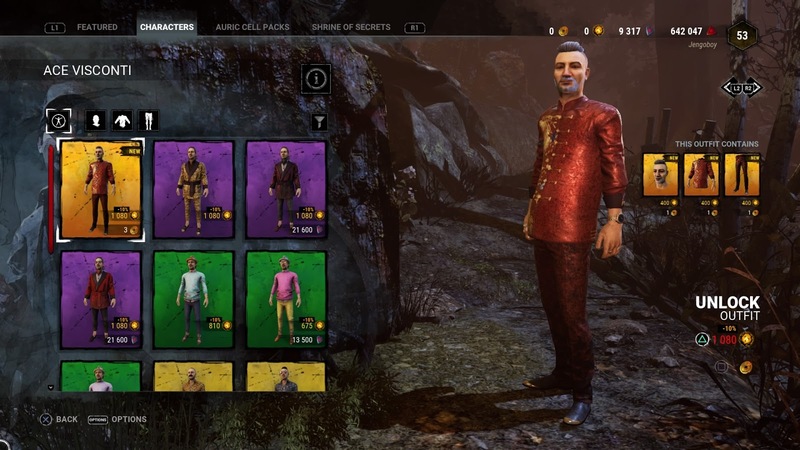 These new outfits are definitely better-looking than previous year's cosmetics! Of course, if anyone is looking to team-up for Survivor, do let me know and I will be glad to help you out! 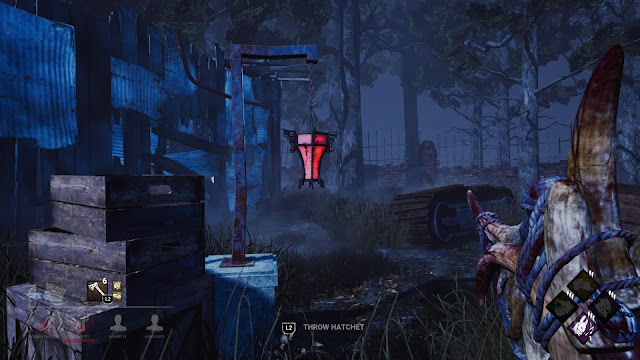 Come join me in Dead by Daylight! A must-have for all horror fans! Affiliate Links may earn this blog a commission, if you click and purchase through these links, at no additional cost to you.